We are currently playing through a test build of a game we built in 3ds Max, from the ground up, for Oculus. 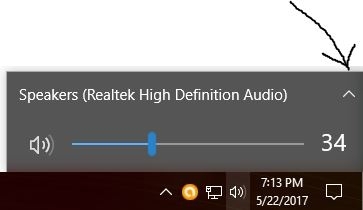 Audio should be coming through the Oculus Rift headphones but they only play through the computer. Is this typical of 3rd party software? Visuals are fine and runs smoothly, only issue is with the audio which will not come through the headphones - anyone know of a fix? Yep, what she just said. Games that launch through the Oculus store should work OK without the Rift being the default device and sometimes you'll find others that work OK without switching too. Everything else though, you'll need to make sure your playback device is set to "Headphones 2 - Rift Audio". 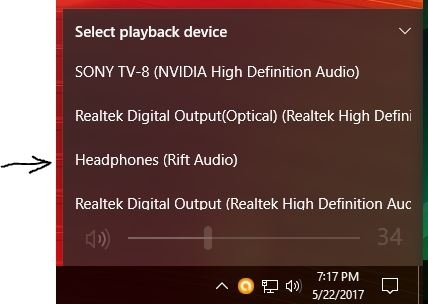 There is also an option in the settings menu in OH to set the audio output to both the Rift headphones and the windows default. So you can have the audio coming out of speakers and the Rift headphones. You can also change the audio output and input to just use windows default only, but then of course you won't hear anything through the Rift headphones. To change those settings via OH, click on the settings cog on the windows OH screen. Go to Devices, then click on your Rift, then you should see the settings for the audio output and input and each has a drop down menu to change the output device. You should then see an option for audio mirroring on the output device. This is the way I deal with it. Perhaps there is another way?